Did any of you get a big dump of snow this week? In Tennessee, we woke up to what I would call a “heavy dusting” this morning, but since that’s about as much as we ever get, we’ll call it a “big dump.” With flu season at its peak, we are still keeping Mr. H Jr. away from crowds, so we watched our church’s sermon online in our pajamas. Our little guy has several fussy moments during the day, but he usually does very well at night. On average, he wakes up three times to eat but falls back asleep within 30-40 minutes, so we can’t complain. This morning, Mr. 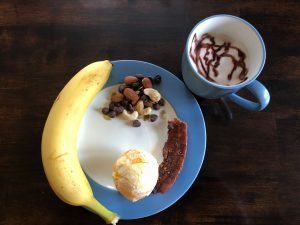 Handsome, who has been very attentive to my needs during my recovery from labor and delivery, brought me breakfast in bed–a banana, an orange, trail mix, a homemade latte, and a slice of candied bacon. After watching the sermon, we went for a short walk to show Mr. H Jr. the snow and then settled in for an afternoon of playoff football. Anyone else watch the Rams beat the Saints? Now we’re tuned into the Patriots/Chiefs games and are hoping to see the Chiefs advance to the Super Bowl.